Once there was a boy who grew up feeling like he couldn’t do anything right. No one would give him the time of day, and everything that went wrong was blamed on him. So he went far away, deep into the woods, to live by himself. On the same day there was a girl who was running away from her abusive father and her poor dead mother. The girl took up residence with a pharmacist in a small town and learned about the uses of plants. She loved going into the woods to search for these plants. One day she heard some beautiful music coming from deep in the woods, and decided to find out where it was coming from. You can imagine what happens next, of course. But the story does not end here. And they do not live happily ever after. We often imagine that love must gush forth spontaneously, surround itself with disarming turmoil, and blossom with a roar. Yet love also advances with muffled tread. Sometimes it hurts to live. This story is about life, death, healing, and forgiveness. Besides the girl and boy, there are a few other characters in the book who play a vital part; a respected doctor, disappointed in love; a school teacher with a mysterious past; and a little girl who grows up in the shade of a Tamarack tree. And the trees. This book is filled with trees; the love of trees both familiar and foreign. They comfort, they beautify, they symbolize, they unify, and they bring hope and healing. They shivered in the slightest breeze, and listening to them made one a poet. Elena’s gaze, though, was always focused farther away, as far as the tamaracks that stood out in the background like merry acrobats. Neither broad-leafed or conifers, they formed a separate group, a somewhat crazy orchestra in the midst of sensible and careful musicians. There is something about this story that is comforting, even as you are crying your eyes out. Maybe it’s in the way the story is told; the simple prose, the magical fairy-tale quality. Or maybe it’s the steadfastness of the supporting characters. When I got to the end, it brought to mind the children’s book, Something From Nothing, where the young boy in the story is given a blanket when he is born. He loves it so much that it gets raggedy and he brings it to his grandfather to fix. His grandfather cuts off the ruined pieces and makes something else out of it. This happens again and again until there is nothing left of it. But the boy still figures out how to make something from nothing. Although the stories are not alike, maybe it’s the message that is the same. We need to learn how to make the best of what we have, and that, even out of loss and change, can come something beautiful. “Between the lines, what was important to me is the importance of beauty in life through poetry, nature, music,” says Eddie, in an interview with The Daily Gleaner. 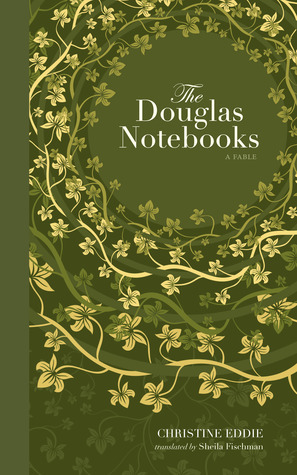 The Douglas Notebooks is both a beautiful book to look at and to read. It was translated from French by Sheila Fischman. 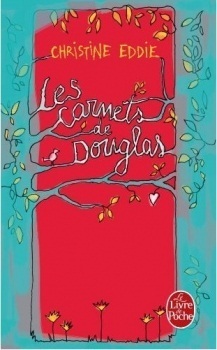 The French edition of The Douglas Notebooks won the 2008 Prix France-Quebec, the 2009 Prix Senghor du Premier Roman Francophone, and the 2010 Prix du Club des Irresistibles. This sounds fascinating and beautiful, and what a stunning book design. I will have to track this down. This is book is definitely worth owning just for the design! What a precious-looking book. It seems like it would be a good little book to read in between two larger works. This book sounds lovely. Adding it to my TBR. Thank you for sharing your thoughts. 🙂 I love all the passages you have shared. The book design is gorgeous. It really is a gem. I hope you enjoy it! This sounds sweet. And what a beautiful copy — I love deckle edge. I like the sound of this… I have a bit of a “thing” for trees. And the cover is absolutely gorgeous. I also have a thing for trees! And, I am always drawn to books with trees on the cover. Making the best of what we have; making something from nothing — beautiful. A few minutes before I read your blog post I read a piece on Louisa May Alcott’s Little Women by my friend Rohan Maitzen, who concludes that “the March girls learn to turn their best faces to the world — and they are richly rewarded for it.” Do you know the picture book Joseph Had a Little Overcoat? Same idea of creating something out of nothing. When I read “Sometimes it hurts to live,” I knew I wanted to read this book. But when I then read that this involves crying one’s eyes out, I knew that I had to read it. And I want the edition with the green cover, although I suppose I could do with the red cover as well. The other editions are all in French, so you might *have* to get the green one. Unless you can read French as well as German (maybe you can!)? I hadn’t realized the red cover was for a French edition. 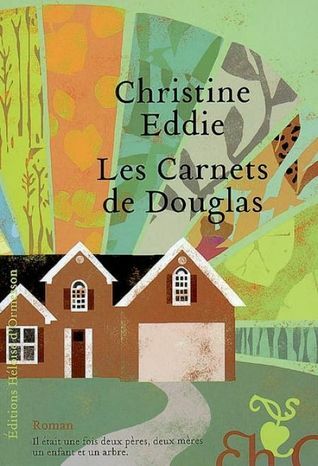 Maybe one day, when I have nothing to do, I could try to read the book in French. Haha, the thought of such a day makes me laugh! You had me when you compared it to Something for Nothing which is one of my favourite picture books. Sounds deeply moving. The stories aren’t the same, but there was just something about it that made me think of it… I think it’s the kind of book that most people would like, unless you don’t like to cry. I absolutely loved this book. Thank you for your recommendation! I get so many good books from you. Loved Something from Nothing! Isn’t is just the sweetest book, especially with the second storyline of the mice going on in the illustrations at the bottom? Anywho, I’ll definitely give this book a try. I love my fairy tale inspired lit. Have your kids read the Adam Gidwitz stuff? I know they’re older now, but they’re some of my faves. We’ve never read Adam Gidwitz, but his books do look good. I love the covers. And, even better, our library has them! I think my younger daughter might like these. 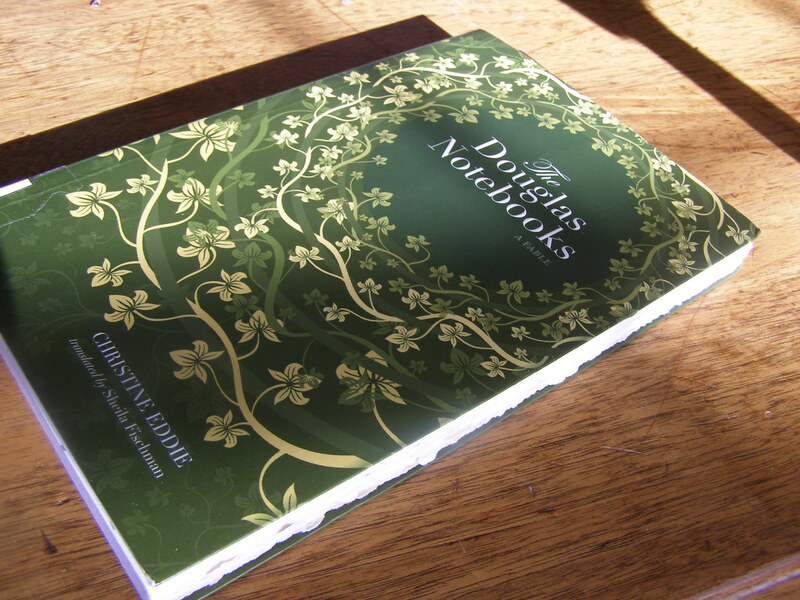 The Douglas Notebooks is the perfect book to practice your French. It’s not too long, and the prose is simple and straight forward. I’m sure it’s even better in French. Let me know what you think! Wow, that’s gorgeous. And what a lovely review. “crying your eyes out”?! That does sound like my kind of book – I love books that wield that much power over readers. It sounds beautiful, in part because it is about two children. Your initial description about the boy – it made me wonder if I sometimes make my little boy feel that way 😦 I will look this one up! Oh no, you couldn’t possibly make him feel the way Romain does in the story. It was very extreme. I love books that make me cry. My husband can’t understand it, but they’re just so good! I’m going to echo the sentiments of everyone else and gush over the cover/s. SO PRETTY. I’m glad the inside of it worked out for you. I love reading beautifully made books. It’s going on the list this very minute. Thanks!!! They just feel extra nice to read, don’t they? I think you’ll like this one! I love the idea of “a school teacher with a mysterious past.” We intrinsically trust teachers to the point where a kid seeing his/her teacher outside of the classroom is mind blowing. Have you ever seen a teacher or professor at the grocery store? Weeeeird. 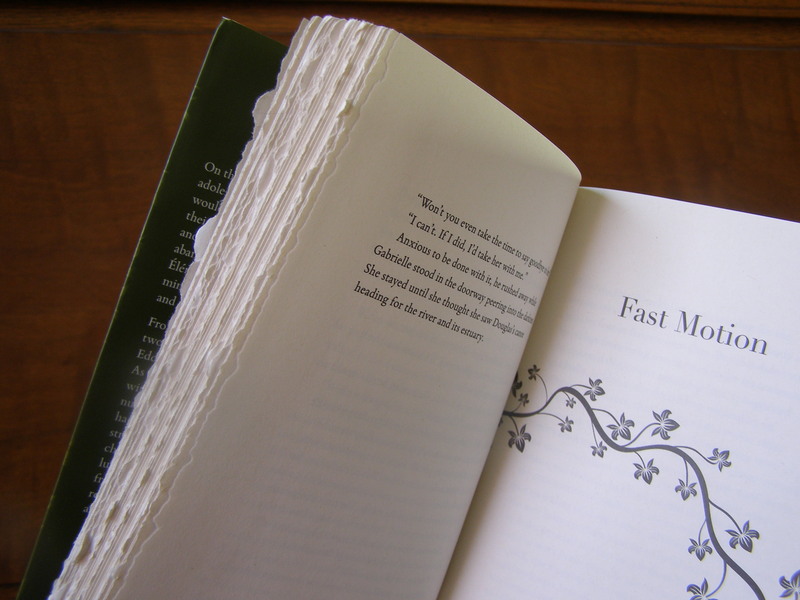 In your last image, I see the book has those unevenly cut pages (what I call “raggedy pages”). I absolutely HATE those. It makes it nearly impossible to quickly flip through, which is cumbersome when you’re trying to find a passage to quote! I think the ‘raggedy pages’ are pretty, but you’re right about them being hard to flip through. I even find it weird to see my kids’ teachers outside the classroom. It still feels uncomfortable – are we friends? acquaintances? should we chat about the kids? the weather? or just walk on by? Haha. Wow, this sounds really beautiful. Gotta get on this. And the cover is sooo instagramable. That’s it. Another one on the birthday list. I have to have this one!! Lovely review Naomi. I thought it was a super deckled edge, too. More than other books. So pretty. Wow, that’s a gorgeous book! Does it have a fairy tale feel to it? It sounds like it would, although perhaps one meant for adults. It definitely has a fairy-tale feel to it. I felt like I was reading a bedtime story to myself. In fact, I had to look up the difference between a fairy-tale and a fable (which is what this is billed as). I guess fairy-tales have happy endings and fables have morals. I’d say this reads like a fairy-tale with a lot of heartache and a message. I love books that make me feel that way 🙂 I’m not sure why, perhaps simply nostalgia.